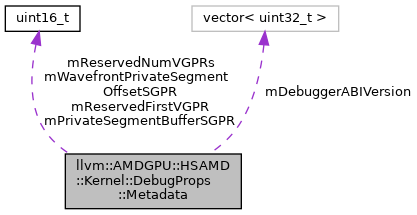 In-memory representation of kernel debug properties metadata. Definition at line 329 of file AMDGPUMetadata.h. True if kernel debug properties metadata is empty, false otherwise. Definition at line 352 of file AMDGPUMetadata.h. True if kernel debug properties metadata is not empty, false otherwise. Definition at line 358 of file AMDGPUMetadata.h. Definition at line 331 of file AMDGPUMetadata.h. Fixed SGPR of the first of 4 SGPRs used to hold the scratch V# used for the entire kernel execution. Must be uint16_t(-1) if mDebuggerABIVersion is not set or SGPR not used or not known. Optional. Definition at line 341 of file AMDGPUMetadata.h. Must be uint16_t(-1) if mDebuggerABIVersion is not set or mReservedFirstVGPR is 0. Optional. Definition at line 337 of file AMDGPUMetadata.h. Consecutive number of VGPRs reserved for debugger use. Must be 0 if mDebuggerABIVersion is not set. Optional. Definition at line 334 of file AMDGPUMetadata.h. Fixed SGPR used to hold the wave scratch offset for the entire kernel execution. Must be uint16_t(-1) if mDebuggerABIVersion is not set or SGPR is not used or not known. Optional. Definition at line 345 of file AMDGPUMetadata.h.